A photo mosaic is an image that is composed of many individual images. The interesting thing about a mosaic on glass is its ability to combine up to 1,000 photos in one image. 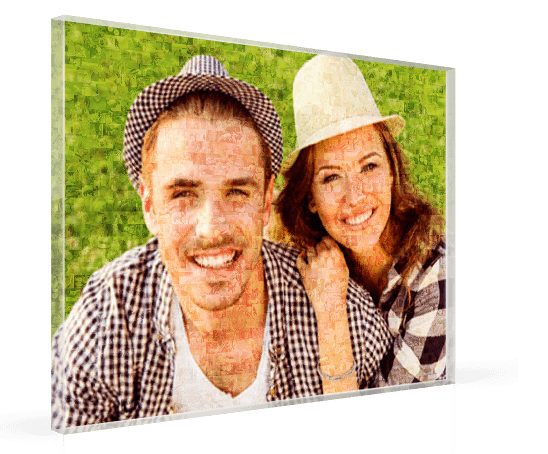 And the best part: these days, you can easily make your own photo mosaic acrylic print on the internet. Preparation is the key. 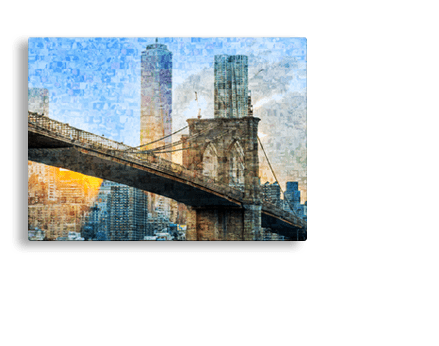 Think about what photos you would like to use for your mosaic. You also have to decide on which image will be the main subject in the foreground. For the background, you should select between 30 and 1000 photos. We recommend using as many pictures as possible, in order to make your photo mosaic more varied. After selecting your photos, transfer them to our application. Since the individual images will be quite small on the finished product (2cm in width), the files don’t need to be more than 100 KB each. The smaller the file size, the less time it will take to upload them all so it’s a good idea to minimise the photos in advance using an editing program. All that’s left is for you to enter your contact details so that your mosaic photo can be sent to you. We need about 1 day, to create your personal mosaic on glass, and to notify you by email. With the mail, you will receive a link to the preview of your mosaic. 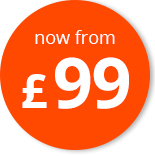 We will usually create two different preview images for you. 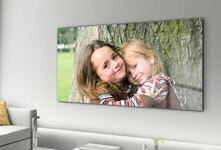 You decide which you like best, and can then directly order it printed on to acrylic glass. 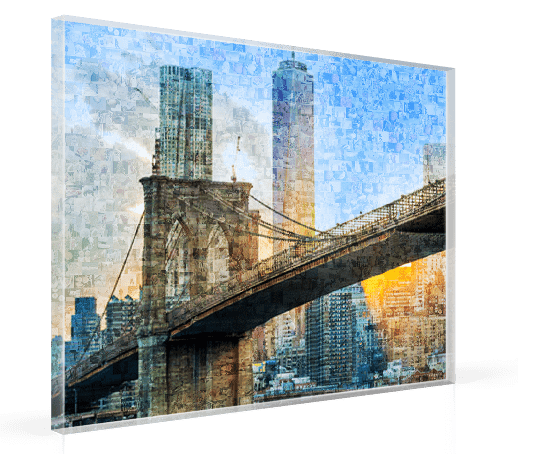 How is a photo mosaic on acrylic glass produced? 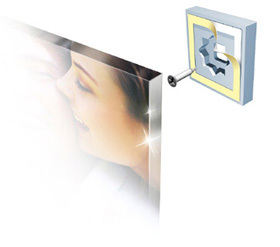 An acrylic glass mosaic is created by connecting two image levels. We create one image layer from many little photos. We arrange these little images so that they are repeated as little as possible. The main picture makes up the second image level. This is displayed semi-transparently as a main image on top of the first level. 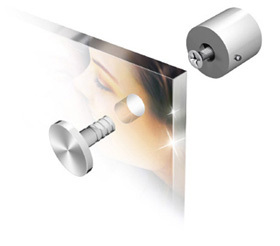 The visibility of the main picture varies according to the transparency. A departmental or company photo mosaic can be produced using portraits of the members of staff. In this way, the sense of belonging to the company and the identification with the employees can be heightened. But mosaics can also be used for the multifaceted presentation of the company externally. For companies, the acrylic glass mosaic is therefore also perfect for communicative purposes. 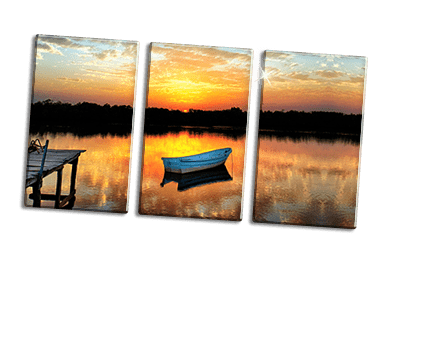 Post-holiday: Most people come home from a holiday with lots of impressive photos, which are ideally suited to printing as a photo mosaic on glass. 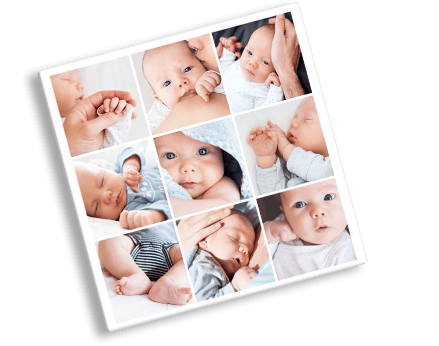 This way, all of your photo memories are captured without having to print out each one individually. For a retirement or farewell: Whenever you have to say goodbye to a member of staff, fellow student, colleague or friend, you can preserve many memories of your time together. 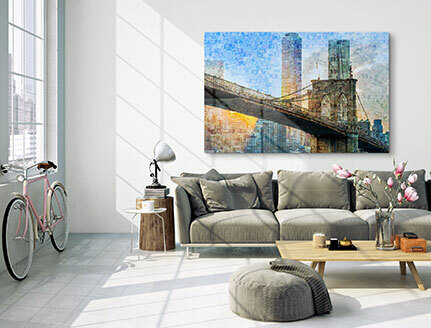 The perfect gift idea for a farewell is to surprise the recipient with a mosaic print. Photos of times spent together will be presented wonderfully. For the dream wedding: Many dream of it being the most wonderful day of their lives. 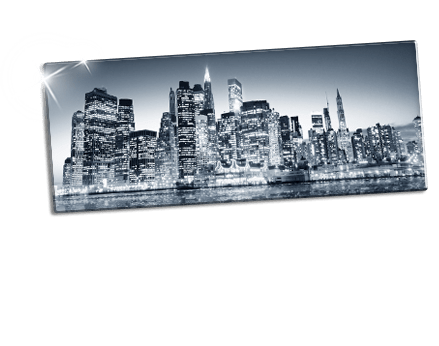 Aside from the professional photographer, many guests will also have their cameras at the ready to capture the occasion and the happy couple. Why not present the collected photos from the day as a gift? 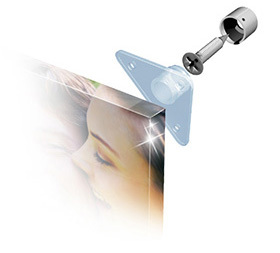 A photo mosaic with the bridal pair as the main motif is sure to be a gift that will bring much pleasure. For a birthday: When yet another year has gone by or for a special, round birthday, too, a mosaic containing many photos of times gone by makes a fantastic present. All those experiences and moments of the past year are captured and beautifully presented.